Welcome to Casa Sierra located on the north side of Sayulita. 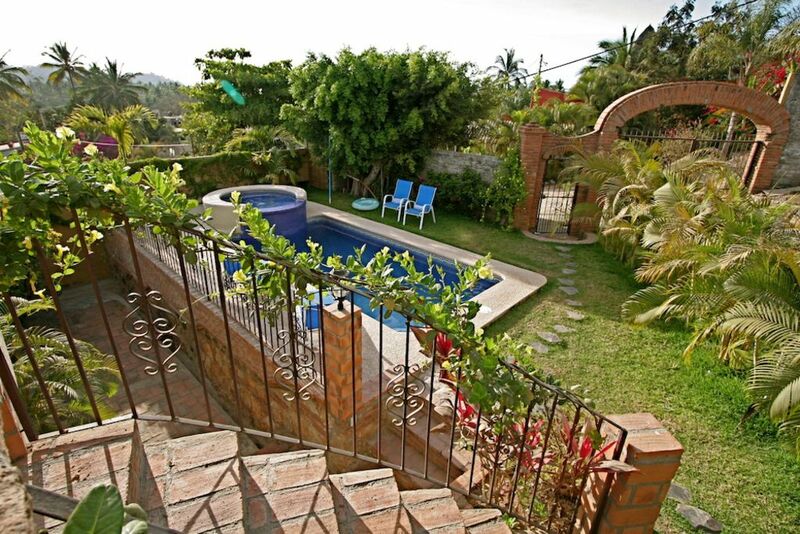 This house was one of the original Sayulita vacation houses built years ago by a Guadalajaran family. It was completely remodeled to create the perfect vacation villa combining old Mexican charm with modern luxury. Located less than two blocks from the beach, Casa Sierra offers FOUR spacious and comfortable outdoor lounging areas providing your group with plenty of space to enjoy the sun or the shade. Fresh breezes from the ocean keep the grounds at the perfect temperature. The north end beach is less than a 3-minute stroll along a picturesque Mexican lane. Each of the three bedrooms is characteristically unique with tastefully decorated furnishings personally selected from designer shops in Tlaquepaque and Tonola. The upstairs mater bedroom, which is accessed via exterior stairs, has A/C and a king bed, and a full bath as well as a huge covered terrace. The two downstairs bedrooms offer AC, queen beds each with an additional twin size day bed. Large ceiling fans are placed above each of the beds if a cool breeze is necessary. Each of the lower bedrooms, which are located right across the hallway from each other, have French doors opening up to the shaded terraces. Simply put, Casa Sierra is a wonderful Sayulita vacation villa combining true Mexican style with modern luxury. Our home offers anything you could possibly wish for during your trip to paradise. For the past 15 years I have called Sayulita my home. Here I enjoy life with my husband and my two young boys. We love Sayulita and love to share all of our local knowledge with our guests helping them create the best vacation ever. As one of the first brick homes built in Sayultia, Casa Sierra is full of history and real Mexcian charm. Completely remodeled to offer modern luxuries while keeping with the traditional Mexican feel Casa Sierra is a perfect blend of two worlds. The location is perfect. An easy walk to beach, the left surf break and the center of town and still far enough away to avoid town noise. Casa Sierra is located two short blocks away from the ocean. The property grounds were nice but the house and guest house could use some updates. There are many areas that need improvement both at the house and communication wise. We didn't have hot water in the guest house for 5 days, we were finally able to get the gardener to check it out, he had to turn on something that was in a locked area, inacessable to guests. There was a real lack of communication and instructions for basic things such as where do we leave the keys upon checkout to what is the code for or how do we set one up for the safe? Although the property has gates and walls, they are easy to crawl over/under. We experienced a theft on the 2nd night staying here, all doors/gates were locked, no forced entry, seemed to have happened while out to dinner that night. An added note we had no idea when to expect the maid or gardner, they came and went at random. Not the best experience. I thought the place was very beautiful and comfortable with a few minor issues that could easily be corrected!! This was my first stay in this area, so excitement ran high!! There were several in our group, but plenty of room for all and a great way to enjoy a stay at a reasonable rate for sure. The views are great and it is so convenient to walk to the beach, even thou you cannot swim at that particular beach due to the rip tides. We had rented golf carts to get back and forth to town and that in my opinion is a MUST to make getting to town easy and fun, otherwise you would waste a lot of time walking!! I felt like everything was in good shape, even thou the maid only came a few times and did not seem to do much more than make the beds, it didn't bother me much on that level, but not having HOT water for about 5 days really SUCKED!! We were in the guest house part of the place, thank goodness I was able to talk to the gardener Marcos one day and he fixed it immediately, and spoke excellent English so you could actually communicate with him!!! However, I feel that it is very important to note that this particular home seems to have some security issues. We were not told how the safes worked, and in fact I was unaware that there was even a safe available until after $950 US money was stolen from us the very first night we were there, even thou the doors were locked and my money additionally was in a locked suitcase! The master bedroom upstairs at the main house, even when locked can be pushed right open with one finger, and being from an area that never locks the bathroom door...well it is pretty important to note that here it is a MUST!! But even after all this, I still enjoyed staying at this home and would totally consider doing so again, I would just keep my valuables with ME! The views are great and it is so convenient to walk to the beach. We had rented golf carts to get back and forth to town and that in my opinion is a MUST to make getting around convenient. I felt like everything was in good shape, even thou the maid only came a few times and did not seem to do much more than make the beds, it didn't bother me much on that level, but not having HOT water for about 5 days really SUCKED!! We were in the guest house part of the place, thank goodness I was able to talk to the gardener Marcos one day and he fixed it immediately, and spoke excellent English so you could actually communicate with his!!! Totally appreciated Marcos. However, I feel that it is very important to note that this particular home seems to have some security issues. We were not told how the safes worked, and in fact I was unaware that there was even a safe available until after $950 US money was stolen from us the very first night we were there. The master bedroom upstairs at the main house, even when locked can be pushed right open with one finger, and being from an area that never locks the bathroom door...well it is pretty important to note that here it is a MUST!! But even after all this, I still enjoyed staying at this home and would totally consider doing so again, I would just keep my cash with me at ALL times!! The property management company was not in the least bit helpful. Casa Cumpleanos made us all very very happy! The main house is every bit as delightful as the photos show, maybe more. The kitchen is completely stocked with anything you might need. This made it easy for the men to cook up their freshly-caught mahi while we ladies sipped our cocktails and drank in the intoxicating poolside view. Situated hillside, the house is surrounded by tropical vegetation and glimpses of small wildlife: hibiscus, palms, banana trees, bougainvilleas, geckos, iguanas, birds and the occasional puppy. Let me say it again, I loved this house. Now I've gushed a bit but this is a review and I promise to remain honest in your best interest,fellow traveler. There were a few annoying details. However slight in the grand scheme of an amazing vacation, they still linger in the memory and kept me from clicking on that 5 star excellent rating. Upon arrival, after an early start on a long journey to Sayulita, we (2 couples) were set and ready to get to the house and relax. Too stinking bad the house was still locked up tight. I think there was an emergency mixed with poor communication on the Mexico side and that left us feeling momentarily dejected. Happily,after checking every door, I was able to wave down some very gracious sunbathing neighbors spotted from the upper balcony who happened to know the ropes. The ladies were kind enough to share their wine while the boys went off and made miracles happen- that is walked up the hill, talked to a lady, made a few calls in the right direction and the house was opened within the hour. Voila! Not too bad...but it could have been much worse. A tremendous thanks to Patty and Shane and Patty and Scott. As luck had it, our 5th party had bailed, so we didn't need the guest house. Good thing too. It was very dusty as if time had forgotten it while a swarm of yellow jackets took up residence in the open air bathroom. We closed the door and never returned. The 3rd bedroom just off the kitchen is very cozy and much more private than initially described. Oh and the hot water heater...is ' piece of crap,' as described by the very helpful handyman/landscaper, Marco. So cold showers. Meh, it's Mexico! NOTES: If out of shape,consolidate walks to town or rent a golf cart. The street tacos are the best! There's a tequila bar on the square that's a must. And if you happen to see a black bug that looks like a scorpion/spider/hammerhead- it isn't poisonous, just really scary.